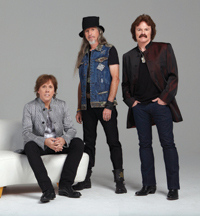 On Wednesday, Aug. 20, The Doobie Brothers will bring their lineup of hits to the Sun Valley Pavilion. Doors open at 7 p.m. The show begins at 8 p.m. The show is presented by the Killebrew-Thompson Memorial golf tournament. Net proceeds from the show will be donated to fund leukemia and cancer research. The Doobie Brothers, originally from San Jose Calif., have sold more than 40 million albums worldwide throughout their career. The group was inducted into The Vocal Group Hall of Fame in 2004. “They are best known, from a sonic standpoint, for interesting, complementary guitar parts that rock, boogie, groove, and occasionally transport the listener to swamps, bayous, parks, trains and highways,” wrote Matt Blackett of Guitar Player magazine. “As durable as American steel, Northern California’s four-time Grammy-winning Doobie Brothers sound has become part of America’s musical firmament, sampled on dance records, reinterpreted on “American Idol,” and a fixture on radio formats from top 40 to classic rock,” states a description on the Sun Valley Resort website. In 2012, The Doobie Brothers released “Let the Music Play: The Story of The Doobie Brothers,” a documentary of the band’s history from their early days of stardom in the 1970s to the present. “They continue to write and record new material, tour the world, boasting one of the most loyal fan bases in music, all while breaking new creative ground in the exploration of their musical connection with Nashville,” the Sun Valley website states. Purchase tickets online at www.sunvalley.ticketfly.com or call (208) 622-2135 or toll free (888) 622-2108. Concert tickets, which range in price from $35 to $250, can also be purchased in person at the Sun Valley Recreation Center Box Office, in Sun Valley Village. The classic rock band The Doobie Brothers will play Wednesday, Aug. 20, at the Sun Valley Pavilion. The show starts at 8 p.m. Purchase tickets online at sunvalley.ticketfly.com or call (208) 622-2135.